Have the Cuts to Interest Rates left you Hiding Under the Bed? Home Our BlogHave the Cuts to Interest Rates left you Hiding Under the Bed? Some savers with cash in the bank may have recently received an unwelcome fright by less than pleasing returns. The Bank of England (BoE) have whittled away at interest rates, which is great news for borrowers, but as some commercial banks follow suit, where does this leave savers? The data in the chart below demonstrates that since 2008, the income realised from keeping cash in the bank is no longer the pay-out enjoyed by savers in its former heyday of the early 00’s. In the interest of keeping the UK economy ticking over, savers could be suffering by sticking with their preferred bank, under the pretence of safety. Could this over cautiousness be costing the public more than they realise? 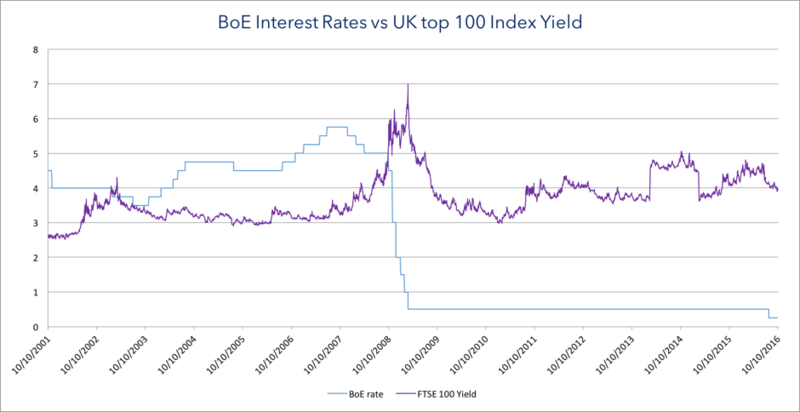 When comparing the return of the UK top 100 Index Yield with the BoE interest rates over the past 15 years, savers who held on to their beloved bank accounts could have found themselves foul of a poisoned chalice. On the other hand, those who made the move from more traditional forms of saving to investing, for example in equities, could have realised some better gains on their capital, since late 2008. The data shows that the dividend yield of the Index from the top 100 companies in the UK remained arguably consistent since late 2009, when compared to the much maligned BoE Interest Rate. Saving vs. Investing: Fight or Flight? Of course, with investing there comes a degree of risk, something which isn’t a consideration on bank deposits. Your investments can fluctuate and volatility is something investors need to consider. However, data shows that the average return on investing in a stocks and shares ISA, over the long-term, came in at a lofty 7.4% in 14/15 when compared to the return on cash ISAs 1.53%. 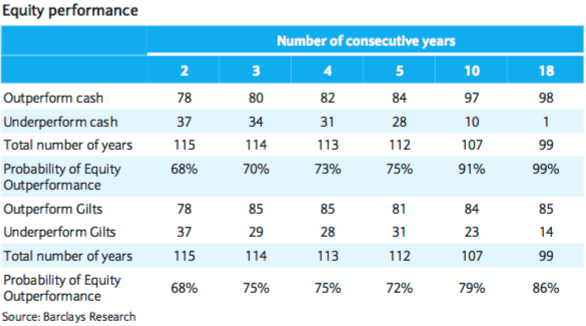 Data from the Barclays Equity and Gilt Study has shown that when comparing the likelihood of equities outperforming cash, over five years this stands at 75%. However, when taking a long-term view, over ten years, the likelihood rises to 91% and 99% at 18 years. Are You Afraid of the ‘Dark’? When deciding where to lodge your savings, it is important to consider how much risk you’re prepared to take. It would be sensible to bear-in-mind that cash in the bank could be argued that it holds its own risk as its spending power may erode over time. For first time investors, deciding where to go may seem like a stab in the dark or a leap into the unknown, but it needn’t be. It is a challenging time for savers and one which has created the need for investments strategies designed to not only protect yourself and your wealth, but also give it the best opportunity to grow. Deciding to accept risk is a personal decision and one which should not be taken lightly and being scared of the unknown is natural. However, in keeping cash ‘safe’, you might find out that there really are monsters under the bed. To find out more about our True Potential Portfolios, please speak to your financial adviser. *Some commercial banks may offer higher savings rates.